Cotton is the leading cash crop in Texas. Texas ranks first in U.S. cotton production. Cotton generates $1.6 billion for farmers, with a state-wide economic impact of $5.2 billion. 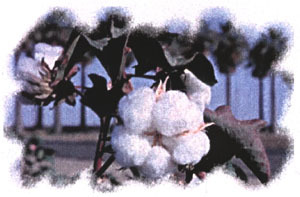 Cotton is grown on five million acres in six different regions, each with different production systems and variations in climate, soil type, rainfall and irrigation, and harvesting techniques. Key insects include boll weevil, bollworm, fleahoppers, aphids, and thrips. Other pests include budworm, cutworms, beet armyworm, spider mites, whiteflies, and other foliage feeders. 12% of Texas cotton acreage is planted with Bt cotton. Bt cotton is genetically altered to naturally control the bollworm as the insect feeds on the plant. The boll weevil is the most damaging insect and involves 37% of all insecticide use. The Boll Weevil Eradication Program is a complex area-wide self-tax/cost-sharing program by farmers to eliminate this pest. Five organophosphates (OP) make up 66% of all insecticide use and carbamates consist of 11% of the insecticides in Texas cotton. Major insecticides include methyl parathion (OP), malathion (OP), azinphos-methyl (Guthion-OP), profenofos (Curacron-OP), aldicarb (Temik-carbamate), dicrotophos (Bidrin-OP), oxamyl (Vydate-carbamate). Other insecticides include acephate (Orthene-OP), phorate (Thimet-OP), and carbofuran (Furadan-carbamate). All planting seeds treated with a fungicide to reduce seedling diseases. Cotton diseases include bacterial blight, cotton root rot, and fusarium wilt but are not treated. Weeds reduce yields and quality, and hamper mechanical harvesting. Weeds delay fruiting and prolong crop exposure to insect and disease pests. Cultivation is practiced by 98% of cotton growers. Hand hoeing works but is costly. Cultivation and rotations supplement chemical weed control but are not an alternative for herbicides. The most troublesome weeds in Texas cotton include annual weeds (pigweed, cocklebur, morningglory, sunflower, devil’s claw) and perennial weeds (johnsongrass, silverleaf nightshade, woolyleaf bursage, Texas blueweed, nutsedge). Trifluralin (Treflan) is applied to 48% or more of the crop. Plant Growth Regulators (PGR) modify plant growth to improve production efficiency. Ethephon (Prep and others) and mepiquat chloride (Pix) are applied on 18% of the total acreage. 57% of the crop is treated with a harvest-aid chemical for earlier harvest and to reduce late-season insects..
Defoliants tribufos (DEF/Folex – an OP) and thidiazuron (Dropp or Ginstar) are applied on 51% of the acreage in 24% of applications. Genetically-enhanced seed, such as Roundup Ready and Bt traits help reduce the number and volume of pesticides in cotton. The Boll Weevil Eradication Program shows promise to reduce insecticide use. Crop Briefsis an information series developed by Texas A&M AgriLife of the Texas A&M University System on critical pest problems and pesticide needs for Texas agriculture. This effort is supported by several cotton organizations, and other commodity groups. Dr. Dudley Smith, Texas Agricultural Experiment Station and Dr. Juan Anciso, Texas AgriLife Extension Service prepared these reports August 2000 using information from numerous sources. Departmental Report SCS-2000-01.The information given herein is for educational programs only. Reference to commercial products or trade names is made with the understanding no discrimination is intended and no endorsement by the Texas AgriLife Extension Service and the Texas Agricultural Experiment Station is implied.